Camping - fan or hater? While it is something I think I romanticize between the times that I'm NOT laying on some hard ground, freezing/sweating, trying to sleep despite it being completely bright out at 6 AM, I would still say I'm a fan. There is something about being outside, making do with what you brought, and being among nature that is invigorating, even if it requires me to to take a long nap once I get home. Before I start the long process of unpacking all the crap I brought. No really, I swear I'm a fan. Foil dinners always remind me of camping. There's something exciting about burying the foil packet among the coals and opening it up to find a finished dinner. (Unless it is still raw, which definitely not as exciting. And which happens to me nearly every time. Unless it is burnt. I really swear I'm a fan of camping.) The flavors all kind of blend and the veggies help the meat stay moist. 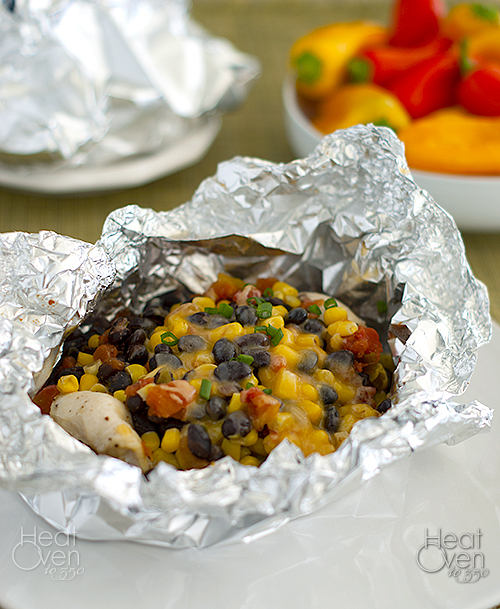 Even if you aren't a camping fan, foil dinners are pretty awesome. The same things that make foil dinners awesome while camping also apply at home when you bake them in your oven or on your grill. They are easy, they taste great, and you throw away your cookware afterward so there is no clean up. Sweet. 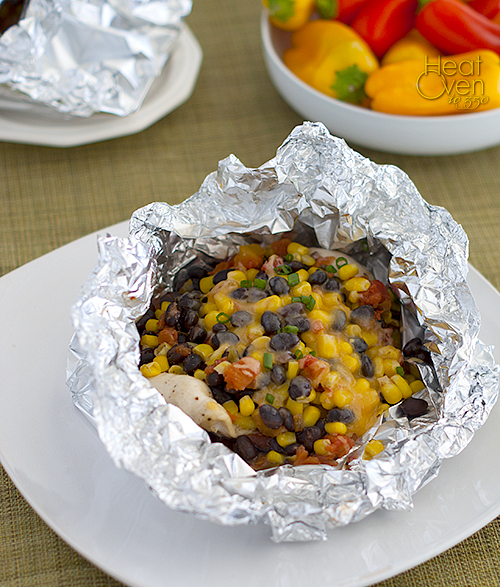 This foil dinner is already popular at our house because we're a big fan of anything Mexican/Southwestern/Tex Mex or basically involving cumin and cilantro. And cheese. It's fast, easy, and healthy. Okay, relatively healthy depending on the amount of cheese you use. I like to double the recipe so there is leftover chicken and bean mixture to chop up and cook in a tortilla like a burrito. If it has been a few years since your last foil dinner, or if you have never tried one, I'd say these would be a great place to start. Heat oven to 425 degrees*. Place four large pieces of foil on the counter and spray them lightly with non-stick cooking spray. Top each foil piece with a chicken breast. Sprinkle with kosher salt and ground pepper to taste. In a medium bowl, combine black beans, corn, diced tomatoes and cumin. Divide mixture among the four foil packages, evenly topping each piece of chicken. Pull up the long sides of foil and crimp together, then fold up the short sides of foil and crimp. Leave extra room in each packet for steam. Place sealed packets seam side up a baking sheet. *Note - This could also be cooked on a grill outside in the summer month. Use medium high heat and cook until the chicken is cooked through, about 15 - 20 minutes. I like to cut my chicken in half before cooking to help it cook a little faster. I want this for lunch! It looks so nice and cheesy. I love everything about this! No doubt about it, I'm a major camping hater. I've only been a few times but that was enough to decide it wasn't for me :) That said, this foil dinner is definitely up my alley - such a delicious flavor combo! I got out chicken to defrost before dinner tonight and was not remotely excited about the boring dinner I had planned. Now I'm going to make this instead! I love anything Mexican/Southwestern, too, so I already have everything for it in my pantry. I love how simple this is! This looks so delicious Nicole. You have the best recipes on your site. I love camping too. We didn't go camping last year because I was super pregnant (sleeping on the ground just wasn't going to happen), and this year I think we might just camp in our backyard (since the baby is not yet 1) with our older 2 sons. My favorite foil dinner is from my time as girl scout: "castaways." (I don't know the story behind the name, sorry.) A baguette, hollowed out, the bread chunks mixed with ground beef & cheese & put back in the baguette, covered in foil & then put in the coals to let the cheese get all melty. Hmmm, I think I need to try that one again...and banana boats too (bananas stuffed with marshmallows & chocolate chips, foiled up & put in the coals). Thanks for all the inspiration!